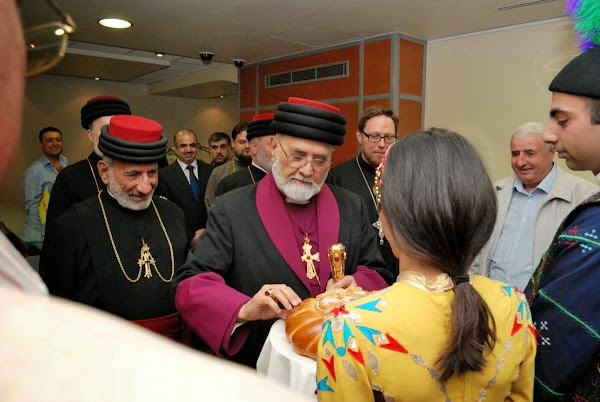 (Assyrian Church) - His Holiness Mar Dinkha IV arrived in Moscow, Russia on 26 May 2014. The Catholicos-Patriarch is visiting Russia at the invitation of the Patriarch of Moscow and All Russia, His Holiness Kirill I. The delegation of the Assyrian Church of the East includes H.B. Mar Aprem (Metropolitan of India), H.B. Mar Gewargis Sliwa (Metropolitan of Iraq and Russia), H.G. Mar Iskhaq Yosip (Bishop of Northern Iraq and Russia) and H.G. Mar Awa Royel (Bishop of California). His Holiness was welcomed at the airport by the Deputy Chairman of the Department for External Church Relations (DECR) of the Moscow Patriarchate, the DECR’s secretary for inter-Christian relations and other DECR staff members. After departing from the airport the delegation proceeded to St Mary’s Church of the Assyrian Church of the East in Moscow where His Holiness conducted prayers and met with church faithful. The visit, coinciding with the 100th anniversary of the beginning of mass migrations of Assyrians to the Russian Empire, will see His Holiness meet with the Russian Orthodox Patriarch, hierarchs of the Russian Orthodox Church and high-level representatives of the Russian Federation. The Catholicos-Patriarch will also pay pastoral visits to Assyrian communities in Moscow, Krasnodar and Rostov-on-Don. His Holiness has made three visits to Russia, including in 1988, when he took part in the celebration of the 1000th anniversary of the establishment of Christianity in Russia.